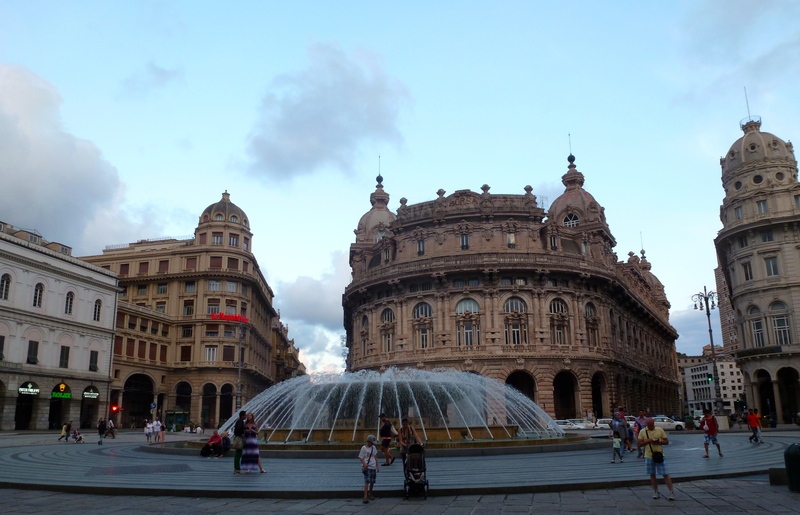 I spent a short yet lovely day and a half in Genoa (Genova) en route to Cinque Terre. I got very lost before finding my hostel mostly because I printed out directions to another hostel in another city but also because it was located at the top of a hill. I blame the hill. I wish I could provide you, dear reader, with valuable information about the museums to see and churches to investigate but instead I will impart one very important piece of information that should NOT be overlooked. ALL* museums are closed on Mondays. *Well almost all. There is a small list of five or so museums that remain open. The tourist offices have small pieces of paper with a list to the unlucky Monday travelers. The aquarium is also open. That being said, I had a wonderful time walking along the port and seeing some of the churches throughout the city. There is a rich history here of merchant families as well as the birthplace of Christopher Columbus. A replicate of his house stands downtown which Genoa seems to be quite proud of although the tourist descriptions of the house are underwhelming at best. Aquarium of Genova-is the largest aquarium in Italy and one of the biggest in Europe. This massive fish tank museum is situated along the port jutting out into the water and was designed for the Expo ’92 Genova where the city celebrated the 500th year anniversary of Columbus’ voyage and “discovery” of America. The admission price is steep (€ 24,00 for adults) and I didn’t have enough time but I heard amazing things. The Metropolitan Cathedral of San Lorenzo was built between 1100 and the end of 14th century in a Gothic style. The Cathedral is a perfect example of the Genoa’s black and white marble layered in alternating stripes. Our tour guide informed us that only four prominently named Genovese families had the prestige to build with this design from the ground to the roofline. All other constructions had to stop midway up the wall and the distinction is evident throughout the city. I loved the whimsical look of the checkerboard buildings, a sharp contrast from the red shingles and brick walls. I saw this style replicated again throughout Italy including in the town of Montorosso while hiking through Cinque Terre. Pesto alla Genovese-is the famous and delicious pesto traditionally eaten over homemade trofie pasta. I tasted the dish in Eataly, a famous chain of high scale grocery stores with small eating stations specializing in meat, fish, pizza and pasta. A favorite in Italy, the store has branched out with at least one location in New York City near Union Square where I ate shortly before leaving for my trip. I would highly recommend visiting one to wander past the shelves of homemade pasta, freshly baked bread and wide selection of Italian wines. On my last day, Genoa’s sky turned dark and started to rain which it kept up until I left. I got to try out the Mom-approved poncho, as ugly as it was effective. I was a dry walking marshmallow as I finished my tour in a hurry. Despite my short stay, I liked the feeling of Genoa. It feel like a hard working port city redefining itself as a key destination for tourists and locals alike. 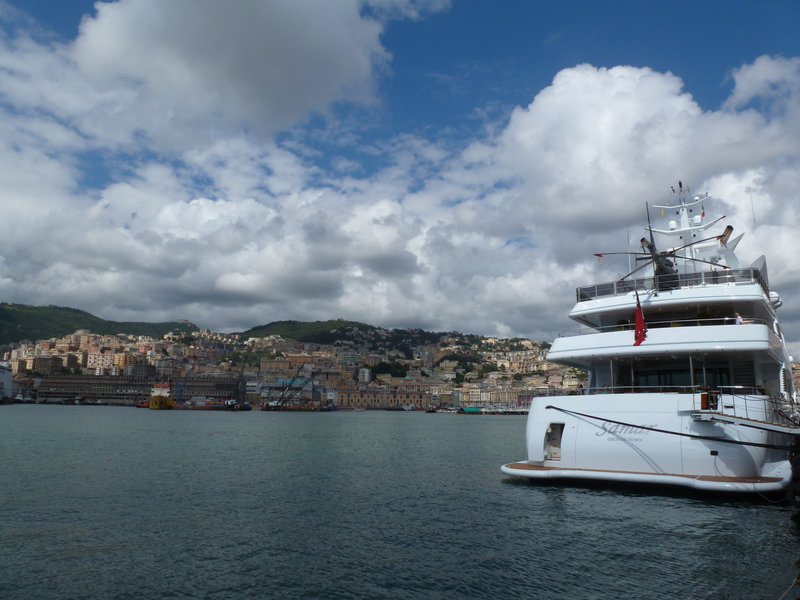 The location is also perfect for day trips to Portofino and other coastal towns. The historic buildings, piazzas and navel museum makes it a perfect destination for anyone traveling along the coast go to or coming from France. Yes, there is a helicopter on top of that yacht. Just don’t go on a Monday.